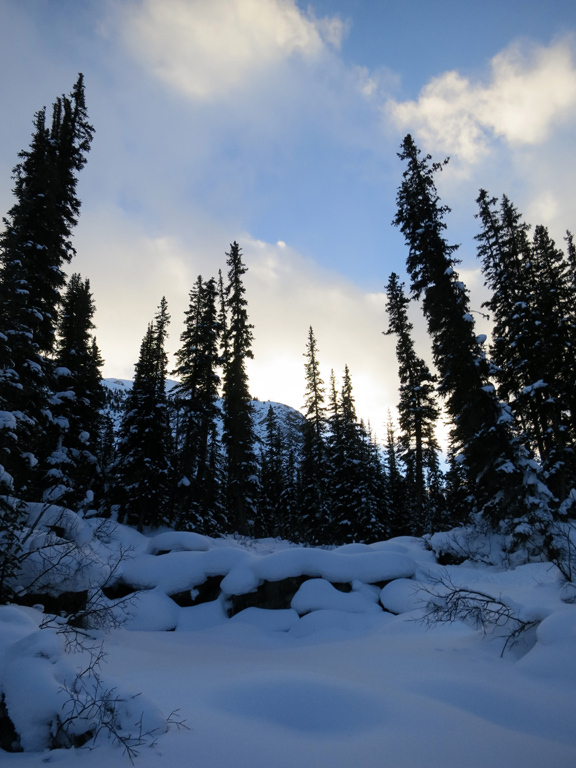 A pleasant day in Jasper’s backcountry. 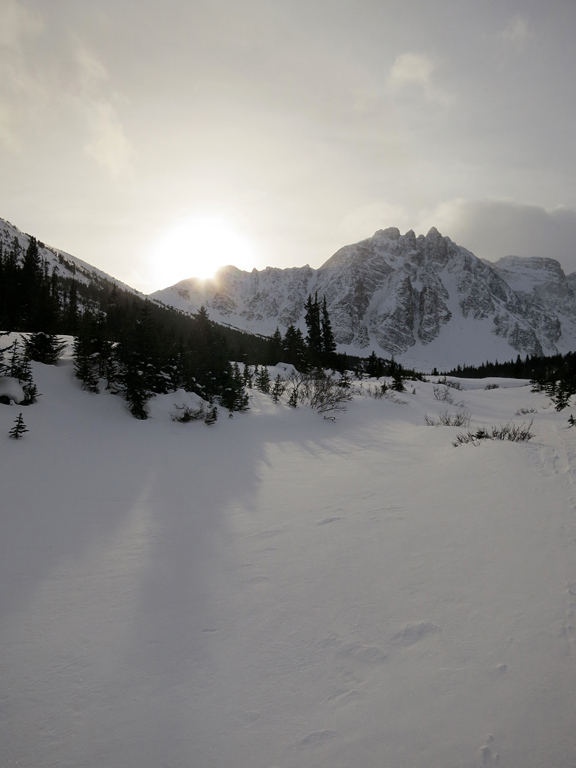 Above: A view Terminal Mountain and Manx Peak at the end of the Whislter Creek valley. 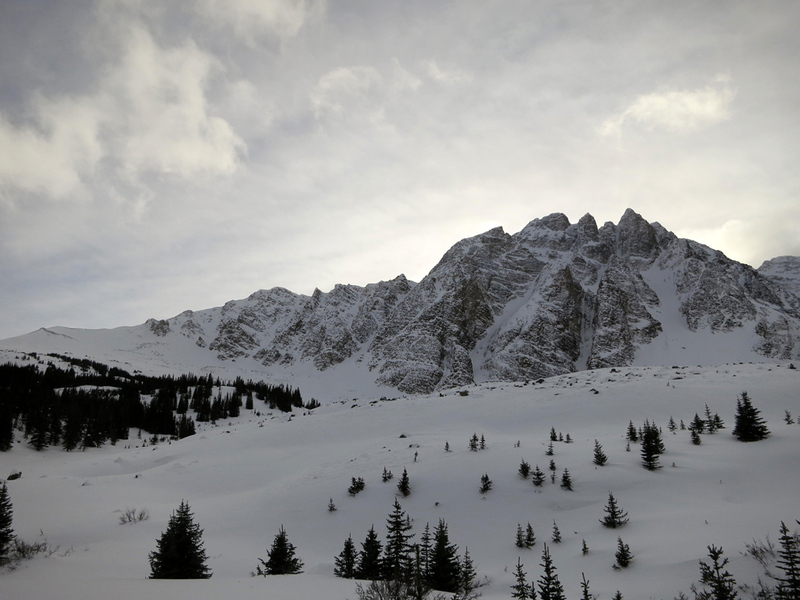 An easy ski tour with mild avalanche risk. Be weary of isothermal snow conditions in the spring. 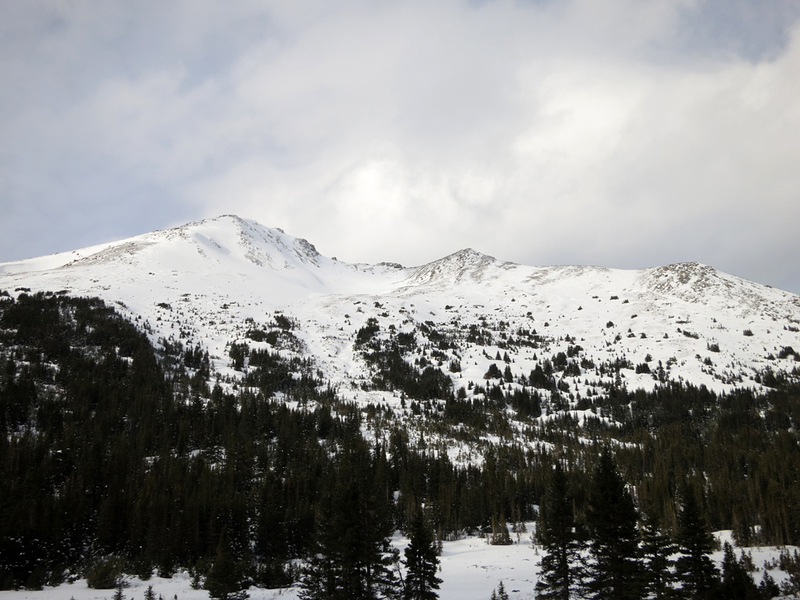 Located to the south of the Town of Jasper, Whistler's Creek is a popular touring destination due to its easy access, gently rolling terrain, and pleasant views. Nestled between Marmot and Whistler Mountains, the creek provides access to a large open valley with a number of passes and easy ascents to further scrambling or skiing. 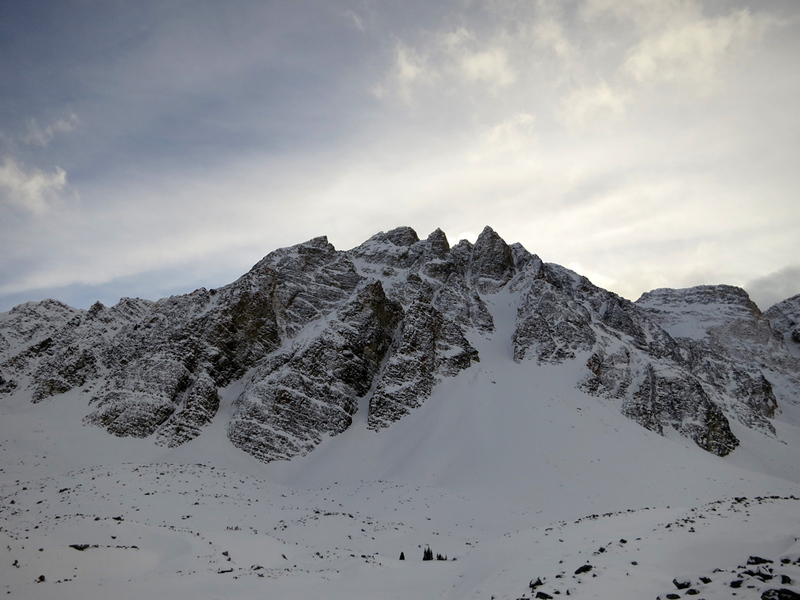 However, due to a possible expansion of the Marmot Basin Ski Area and a new initiative to protect caribou populations in the Tonquin region (amongst others), it's quite possible that access to this area could become lost during the winter months, or severely curtailed. With no maintained trails, and with open areas that become marshy in milder weather, Whistler's Creek isn't an ideal summer destination. 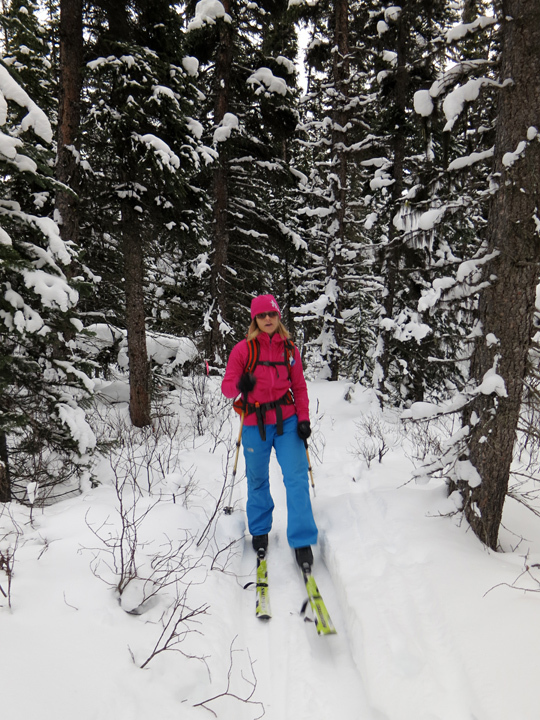 A week before Christmas, Vicki and I took advantage of some great weather and snow conditions, and moderate avalanche conditions, to get out and enjoy a bit of a tour in Jasper's backcountry. 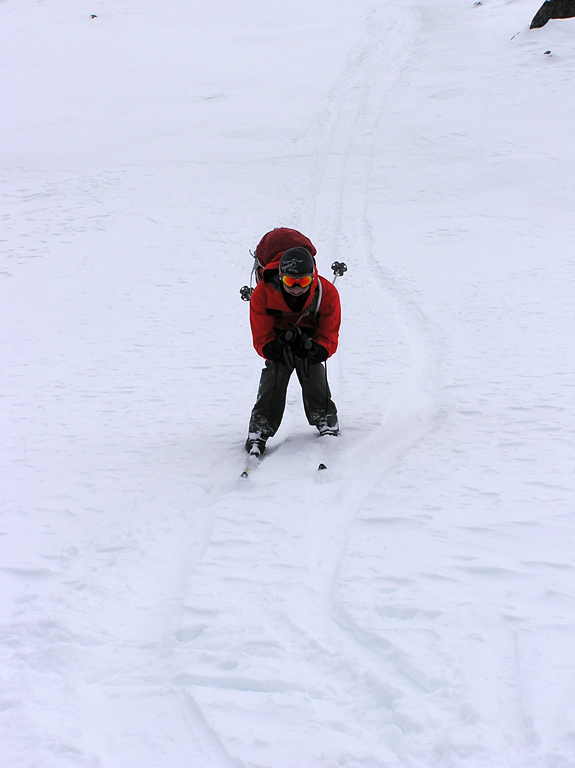 It was my first time using both touring-oriented cross-country skis and skins (a grippy fabric surface one attaches to a ski base for additional traction) and, aside from an aggressive pole plant leading to a bit of a faceplant in soft, unsupportive snow, many good times were had. A tour of Whistler's Creek begins from a point between the top two parking lots at the Marmot Basin Ski Area. 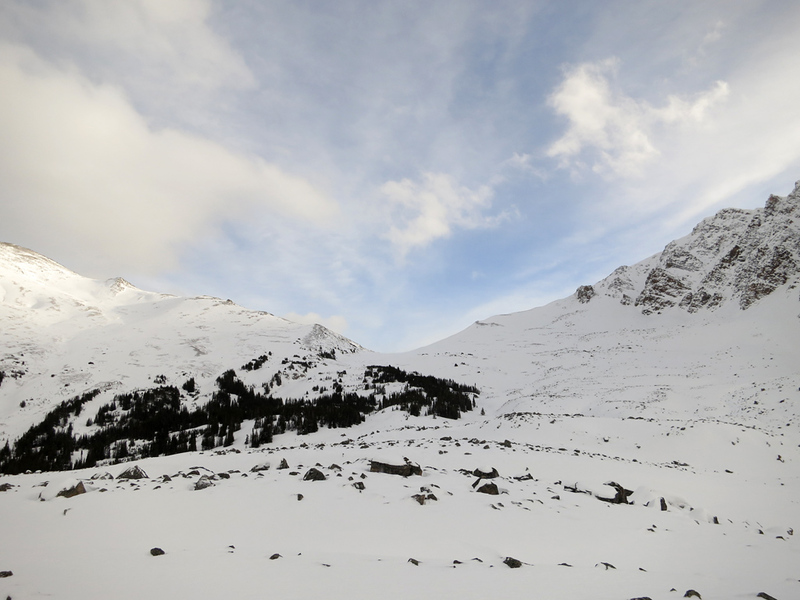 To reach this area, head south from the Town of Jasper along the Icefields Parkway (Hwy 93) and look for the well-signed turnoff for Marmot Basin (and Edith Cavell) about a kilometre south of the park gates. After following that road for a few kilometres, you'll turn right onto Marmot Rd. and then follow that road to its very end, past the base lodge, to the highest parking lot on the mountain. You'll want to stay near the entrance to this lot, as the starting point for the creek is a little down the road to the north. Chances are that you will see tracks leading across the ditch and into the woods about mid-way between the third and fourth parking lots, especially since the first sections of the tour are used by skiers and snowboarders returning from descending the “sidecountry” off of Marmot's Paradise chair. 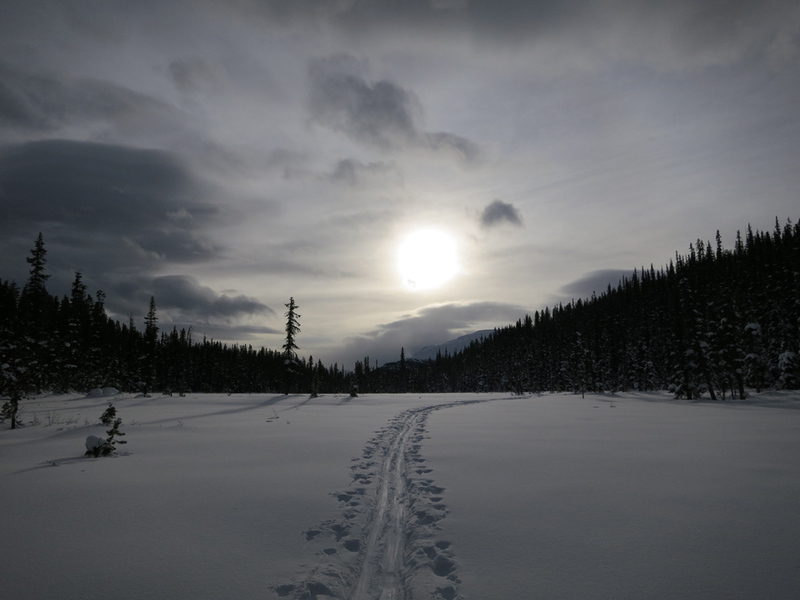 After crossing the ditch, a few minutes or northwesterly travel brought us out to a large open area which we quickly traversed before plunging back into forest along a well-established trail for the next few kilometres. 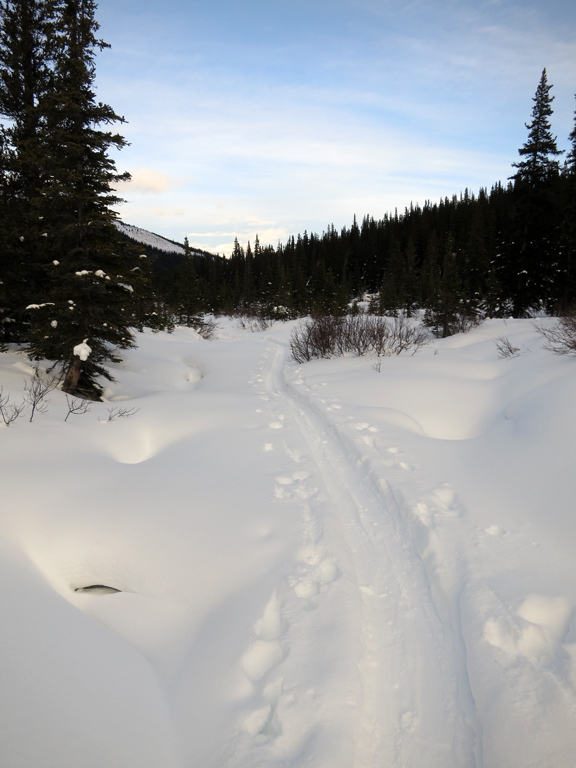 In fact, Marmot Basin shows both the beginning of this route and the clearing I mention on their trail map (bottom right). If for some reason, a heavy snow perhaps, you can't find a trail leading that area, there isn't much in the way of directions I can provide beyond our recorded GPS track and the recollection that we trended to the left (south) side of the valley for a while before travelling directly along the creek itself. 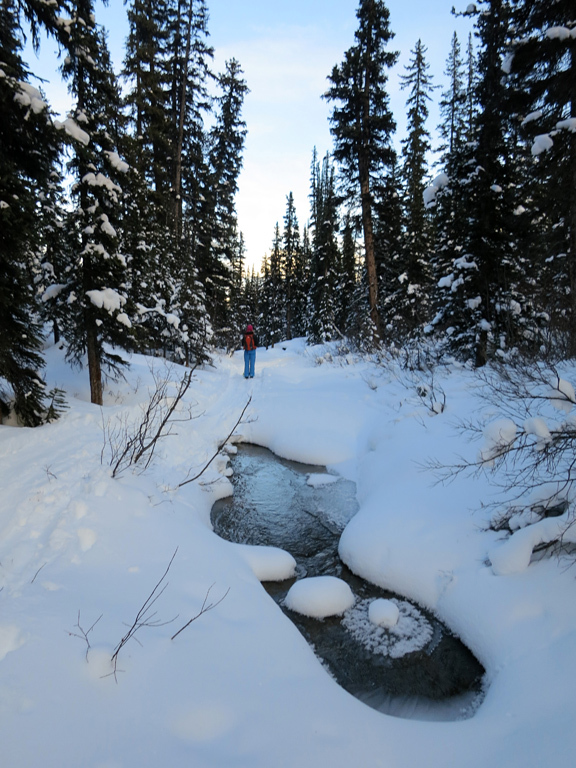 Needless to say, solid snow bridges over the creek are a must as you'll be crossing from one side to another frequently as you make your way in and up. 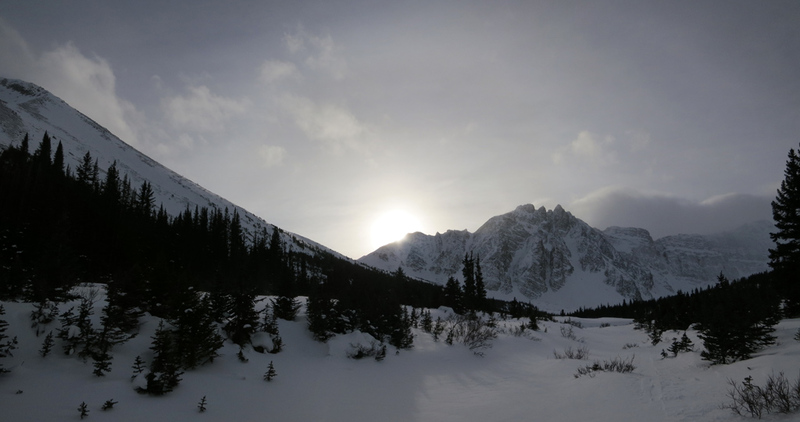 Morning sun near the trailhead, not far from the Marmot Mountain skier parking areas. Once you reach the huge open area of the valley towards the far side of Marmot Mountain, options abound as to where you can proceed. 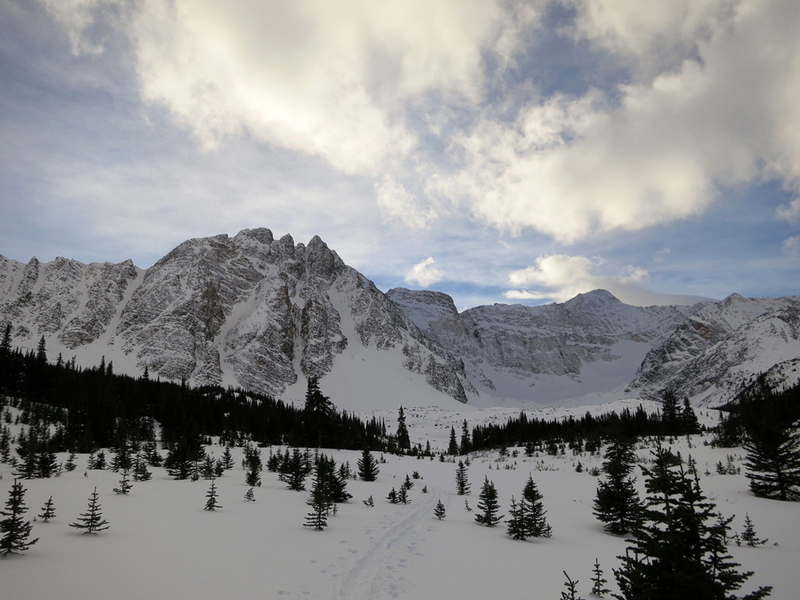 For us, this is where the established trail came to an end, and we decided to break a new one towards an elevated moraine near the base of the dramatic looking Terminal Mountain. 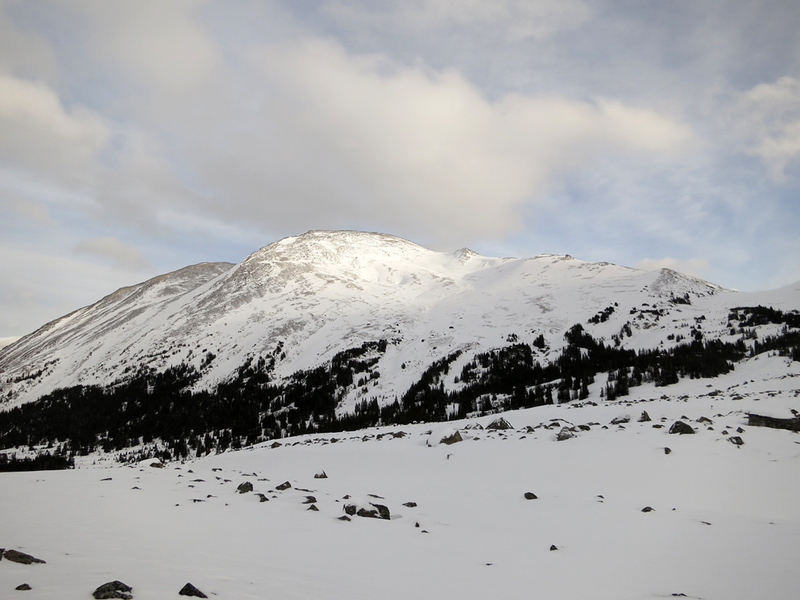 We figured that would give us a nice view of the overall area, including a pair of nearby tarns, and we weren't mistaken. 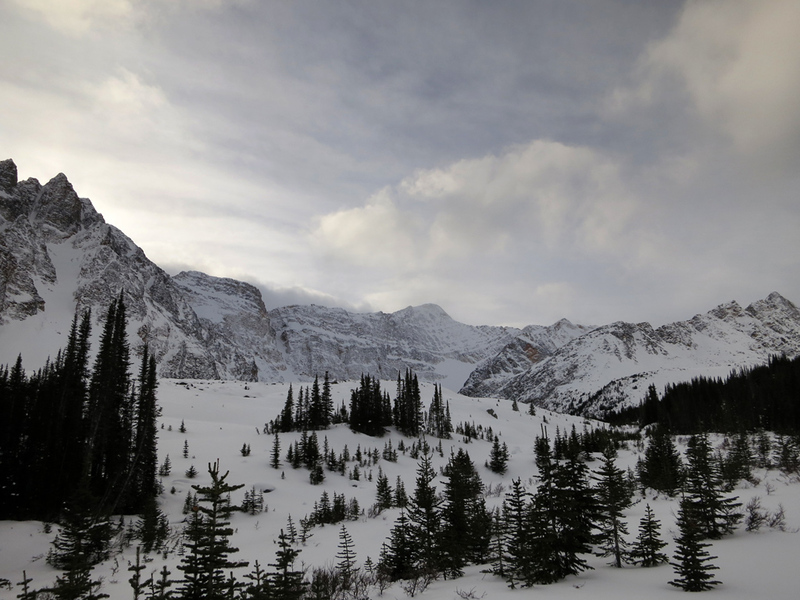 That said, one of the unfortunate realities of winter travel in the Rockies is that tarns and small lakes, highly prized destinations throughout most of the year, are usually reduced to boring and featureless snowfields. While I'm certain that we found those tarns, it would have required several days with our avalanche shovels to render them picturesque. Making our way through the forest. Thankfully the creek was well bridged. 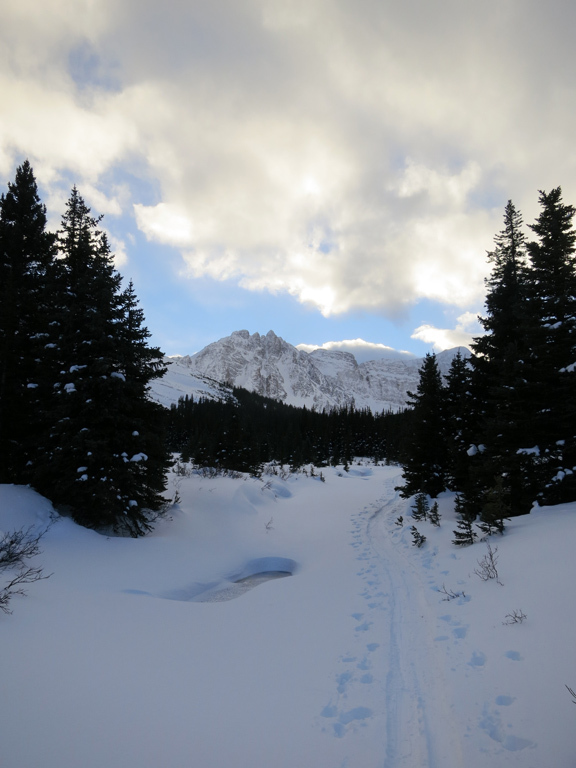 After enjoying some lunch in a sheltered spot, and then messing around with our cross-country skis on the steeper portions of the moraine descent, we retraced our route across the valley and along the creek, and then returned to town for some well-earned carbs at Jasper Pizza Place. As mentioned earlier, Parks Canada is considering new measures to protect the caribou in the Tonquin region, and this will likely result in a seasonal closure of this area from late November through the beginning of March. Of course, this is the exact period of the year you would want to do this trip, but there should be a window of opportunity in March where there should be sufficient supportive snow for this trip. Viewing the backside of Marmot Mountain from the far end of the valley. Those on AT or telemark skis will likely be interested in skiing the backside of Marmot Mountain, the summit of which can easily be attained from the west by following the gentle ridge that extends from the pass between Marmot and Terminal Mountains. Similar opportunities may also exist to the north on Indian Ridge. 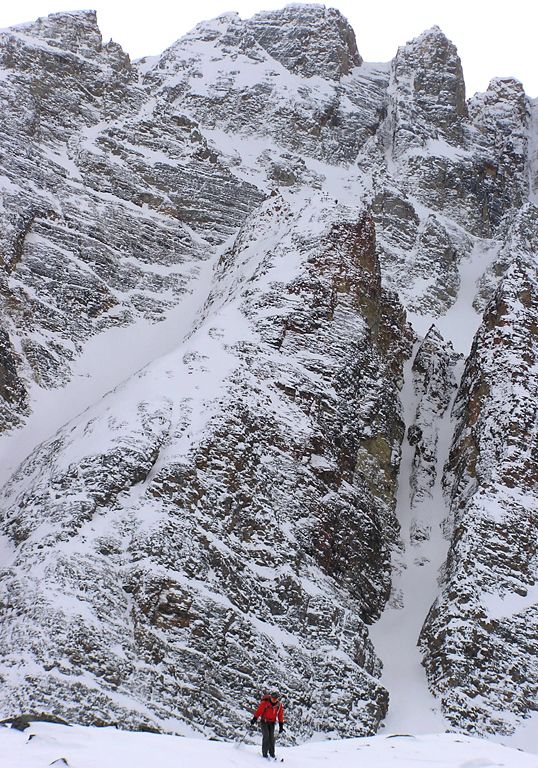 As usual, you'll want to examine avalanche conditions before committing to either. 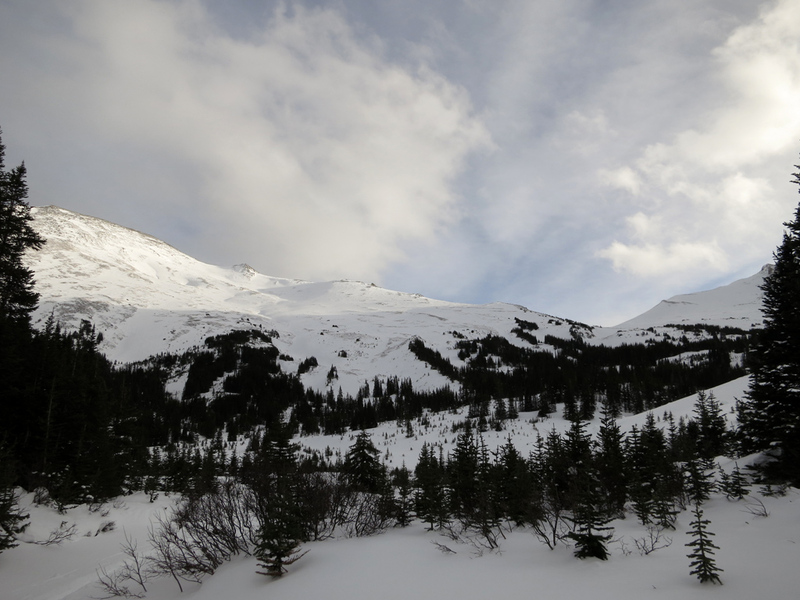 Another possibility that I hope to do one day is to complete a full tour around Marmot Mountain, which can be achieved by following Whistler's Creek, ascending the pass between Marmot and Terminal, and then returning to the road via the Maccarib Pass trail. You'll likely want two cars for this to save you a lengthy hill ascent on Marmot Road at the end of your day. Summit: 2,762 m / 9,062ft.